By Sam Smith | 12.18.2015 | 10:55 p.m. The Bulls and Pistons Friday battled back and forth in an historic four overtime slug match that eventually went to the Pistons in the fourth overtime, 147-144. It was the second Pistons overtime victory over the Bulls this season. It ended the Bulls four-game winning streak as the Bulls had to quickly board a flight for a Saturday night game in New York. The Bulls fell to 15-9 after the three-hour marathon game. The Pistons are 16-12. Jimmy Butler, who made a three pointer with 4.4 seconds left in the fourth overtime to bring the Bulls back within one and then missed one to tie at the buzzer, had a career high 43 points in playing 55 minutes. Derrick Rose had a season high 34 points in 54 minutes. Pau Gasol had 30 points as the trio became the first Bulls since Michael Jordan, Scottie Pippen and Toni Kukoc in 1996 to score at least 30 points in a game. It was the Bulls second four overtime game in franchise history. They won the other over Portland in 1984. Gasol played 48 minutes and Taj Gibson 44 as coach Fred Hoiberg essentially went with the starters in the four overtimes. Gibson had 14 points and 12 rebounds. The Bulls bench combined for just 20 points. Andre Drummond had 33 points and 21 rebounds for the Pistons, but it was Reggie Jackson who saved it for Detroit with a big fourth overtime. Jackson had 31 points and 13 assists as his pick and roll with Drummond flummoxed the Bulls all night. Marcus Morris had 20 points and a big three to extend the game in the second overtime. The Bulls got into the game somewhat slowly, failing to score in five of their first seven possessions as Detroit went ahead 9-4. But the Bulls then had a good stretch with scores in six consecutive possessions led by Gasol to move ahead 18-16. 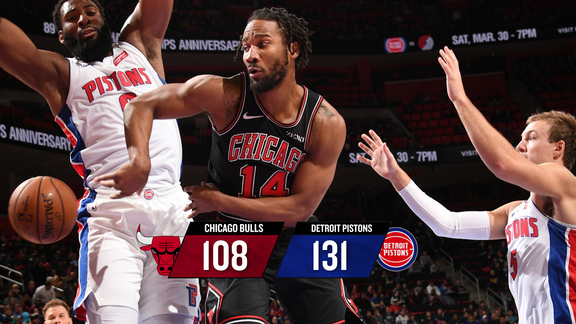 The Pistons, however, took a 30-27 lead after one quarter as the Bulls again had problems on the offensive boards, though the Pistons feature top rebounder Andre Drummond. Butler led the Bulls with nine points in the first quarter, but picked up a quick third foul in the second quarter and sat out most of the quarter. Rose was attacking the basket with regularity, though he had his shots just rolling off the rim. That did present some follow up score opportunities for teammates while Rose and Gasol did work their pick and roll play well. Rose had 11 in the half on three of 13 shooting while Gasol had a dozen points. The Bulls midway through the second quarter slipped behind 43-35 without Rose and Butler and then teetered and tottered the rest of thee half as the Pistons held a 55-52 halftime lead. Drummond had 12 in the half for the Pistons. The Bulls began to ease the game over to their side in the third quarter, mostly behind the pace and thrust of Rose, who had 11 points in the quarter, including a late run of a three and then three consecutive scores with a floater, a runner and a show and spin back jumper. But the Pistons remained relentless, especially on the boards. After the Bulls took a 69-62 lead, the Pistons got a pair of second chance scores. The Bulls went into the fourth quarter leading 77-74 behind 22 points through three from Rose. The Bulls went to Butler to open the fourth, but the Pistons continued to dominate with second shots, turning three straight possessions into second chance scores to take an 81-80 lead with 8:49 left in the game and sending the Bulls into a timeout. With just over five minutes left and Rose checking back into the game, the teams were tied at 87 with Noah and Gasol again playing together at the close of the game. The teams went down the stretch exchanging scores as both offenses were better, or defenses worse. The Bulls got a nice drive and scoop from Gasol and a pair of clutch free throws and a big three from Tony Snell in the last minute after a Snell turnover. But the Bulls failed to foul Drummond, who tied the game with a short floater with 18.4 seconds left. Rose in a brilliant game dribbled it down for a last shot in regulation and missed. The Bulls fell behind to open the overtime as the Pistons scored in the first four possessions as the Bulls kept getting beaten on their pick and roll. Rose countered with three straight driving scores for the Bulls. Reggie Jackson made one of two free throws with 11 seconds left for a 116-114 Detroit lead after Gasol made one of two just before then. The Bulls went to Butler, who drew three defenders. Gasol rolled down the lane for the tie at 116 and Jackson missed a fade at the first overtime buzzer. The Bulls got on the boards in the second overtime with Drummond in foul trouble, taking a 121-117 lead on a Butler jumper. But the Pistons came back with a pair of threes to tie the game at 123 with 36.9 seconds left in the second overtime. Butler and Jackson then missed to send the game into a third overtime with an exhausted group of starters for both teams playing extensive minutes. The teams exchanged five misses in the last minute to go to the fourth overtime. The Bulls seem to regain their offensive energy in the fourth overtime, but they were unable to stop the driving and shooting of Jackson, who led the Pistons to a 136-129 lead to open the fourth overtime. The Bulls fought back behind four Butler scores in a big fourth overtime as the Bulls continued with basically the same five through all four overtimes as did the Pistons until foul problems late.